Deal: 4 Items for the Price of 3, in amazon Lighting Offer with voucher code “LIGHT4FOR3"
Using only 25W of electricity, the Biobulb produces a bright light equivalent to that of a 100W incandescent bulb. Just a note on lighting:(turn electric off)Its a good idea to check all your light fixings are not loose and you dont fit your bulbs at an angle.Also look out for stretched wires on light fixings.That way your bulbs will last alot longer this winter.There are a few reasons bulbs can blow, the major one being cheaper bulbs. The elements in cheap bulbs are much thinner and any surge of power, however slight, simply breaks them. 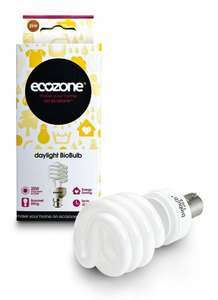 Always go for more expensive, better quality light bulbs, its cheaper in the long run. Just a note on lighting:(turn electric off)Its a good idea to check all … Just a note on lighting:(turn electric off)Its a good idea to check all your light fixings are not loose and you dont fit your bulbs at an angle.Also look out for stretched wires on light fixings.That way your bulbs will last alot longer this winter.There are a few reasons bulbs can blow, the major one being cheaper bulbs. The elements in cheap bulbs are much thinner and any surge of power, however slight, simply breaks them. Always go for more expensive, better quality light bulbs, its cheaper in the long run.A loose connection in the lamp holder can also cause bulbs to blow. This is because the circuit is not completed as tightly as it could be and the electricity may have cause to "arc" or jump across the contact, rather than simply flowing through it. When this happens it produces more heat in the fitting than is expected or catered for by the bulb, and the bulb can blow.The same can happen if the spring loaded connection in the bulb holder is slightly loose. This will cause electricity to arc across the contact, cause too much heat and blow the bulb. This can very often be diagnosed by looking at the contact on the bottom of the bulb to see if it is pitted.Arcing electricity effectively melts the metal it is arcing onto ( This is how arc welding works) so if the bulb contact is being subjected to arcing, tiny little indentations occur, called pitting.It is sometimes possible, if the live connection in your light switch is a little loose, for this to happen here also. Heat will be generated and it is possible, though very very remote, for the bulb to blow as a result of this. thanks been after these for a while. Find the daylight bulbs too expensive. and they don't last as long as they used to when they first came out.